Specialty items like animal leashes and riding apparel need leather sewing machines to complete. Unlike regular sewing machines, leather machines are heavy-duty, with thick, strong needles and a walking pressure foot to accommodate the multiple layers. Unlike fabric, leather is stiff and thick. It’s not as flexible as cloth. To produce professional products you will need leather sewing machines. A dog collar made from leather can be up to one third of an inch thick and a horse bridle almost half an inch thick. Softer leather can be slightly flexible but many types of leather barely bend. Sewing a curved seam is almost impossible without a specialty machine. Hand stitching leather is time consuming, and unless the project is for personal use, the time it would take to make an item by hand would be cost prohibitive. Many of the best leather machines are industrial or commercial sewing machines that can sew multiple and thick layers of leather. These machines are equipped with a walking foot that allows each side to work independently providing even tension when sewing a curve or reinforcing a seam. Industrial sewing machines for home use are available. Many come with their own table. Some standard sewing machines will sew leather, but it is important to read the manual to be sure that a non-industrial sewing machine is able to handle the task you have in mind. Since I've become interested in sewing leather bags I have been spending a lot of time researching machines that would work best for the variety of sewing I do, yet perform really well with heavy materials such as leather. 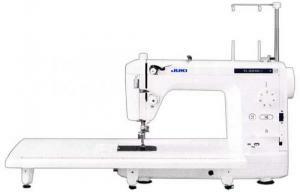 The Juki TL2010Q sews beautifully through multiple layers of fabric. The even feed foot does a wonderful job of sewing tricky fabrics like georgette, velvet, and leather. I really appreciate the predetermined up/down stop position of the needle. I has an automatic needle threader. It comes with an automatic thread cutter which also has the option of being controlled through the foot pedal! Very conveniently located switch on front to raise and lower feed dogs. This machine comes with a large extension table, perfect for quilting. I love the knee lift lever as I am so used to it on my industrial machine! Accessories for some home sewing machines might allow you to sew thin garment weight leather but you will need to use special needles for all your leather projects - cloth needles will break. Needles for leather and suede are specially formed with a chisel point to cut into the leather during stitching. If you'd like to try sewing leather on your own machine, I'd suggest this great course offered by Craftsy on Making Leather Bags. You'll learn a ton of tips and techniques to get your domestic machine set to sew leather without a problem! Buying one of the many types of leather sewing machines might open up employment or small business opportunities. Custom leatherwork is hard to find. Many service animals, law enforcement and search and rescue canines need durable leather gear that often needs to be custom fit. Search and rescue canines wear leather booties to protect their feet from broken glass and hazardous materials. Service animals including miniature horses, dogs and primates may need special harnesses to perform their tasks. Sewing leather motorcycle gear and apparel, custom upholstery and seat covers are a few other ideas that could be transformed into a money making venture. Modern manufacturing, technology and demand have made leather sewing machines available at affordable prices. Many manufacturers also offer reconditioned or trade-in models with warranties. Learn How To Sew Leather with Professional Results!